Borogrove Press is a joint project between DeAnna Knippling of Wonderland Press and Jamie Ferguson of Blackbird Publishing. Current projects include the Amazing Monster Tales anthology series. 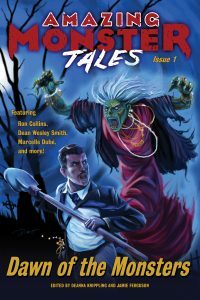 Amazing Monster Tales is here to provide it! 11 tales of monsters, mayhem, strange and inexplicable events, uncanny technologies, wildly improbable events, and more. Some monsters you’ve seen before…and some of them you haven’t! And some of them are very, very bad indeed!